This is a bulky weight hat made from wool with thin contrast stripes in silk and tencel. The variegated part is a blend of various kinds of wool with bits of silk blended in. Each color was dyed separately, then the colors were carded together and spun into yarn. The thin red stripes are tencel and the gold is tussah silk. The blue and light green stripes are soy silk. 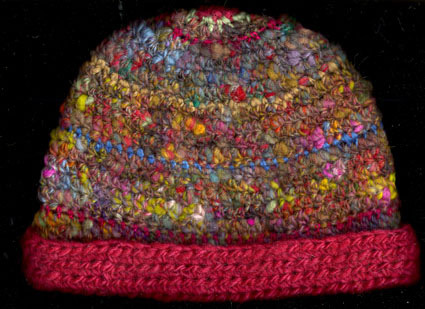 The red brim is Corriedale wool.